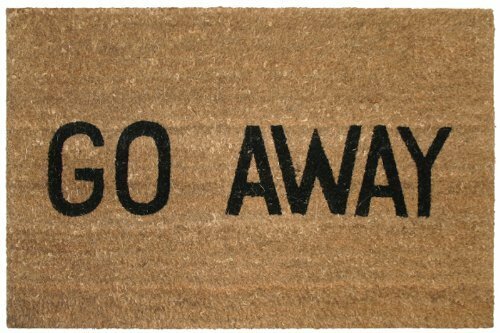 Tell your guests exactly how you feel with this creel mat that exclaims, "GO AWAY". A 100% natural coconut fiber doormat, that is great to use year round. Trap dirt outside your entrance, while increasing its appeal. The fibers are weaved on the bottom of the mat, so there is no synthetic rubber backing. This allows water to easily drain through the mat. Size: 16" (L) X 27" (W) X 1" (T). Manufacturer: William F. Kempf & Son Inc. Publisher: William F. Kempf & Son Inc. Studio: William F. Kempf & Son Inc. If you have any questions about this product by Kempf, contact us by completing and submitting the form below. If you are looking for a specif part number, please include it with your message.